Rose Meyer, 2015. Carbon prints. The first official Post Office in New Zealand was set up on the 17th of March in 1840 by (self signed) postmaster William Clayton Hayes. Hayes operated the PostOffice out of Kororareka¹, a busy port in the North Island. Hayes was postmaster until September of the same year as his appointment, and became the first civil servant in New Zealand to be fired for inebriety and misconduct, during his short time as postmaster he managed to embezzle the princely sum of £69.13.1d. The premises used for the PostOffice later became the local Policeman’s residence, which it still remains today. In September 2015 I sent a postal bag containing a blank piece of paper and a sheet of carbon paper to that address, addressed to William C. Hayes, Postmaster in 1840, ten days later it was returned to me. The current resident at the address had cut the bag open³, examined its contents, repacked and resealed the postal bag and taken it to the Post Office to be returned to sender. 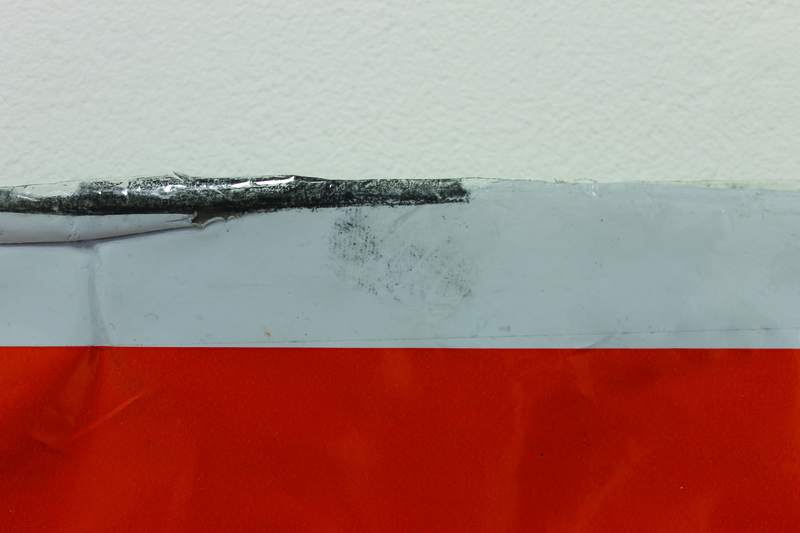 During this process their fingers picked up traces of carbon from the contents of the package and while taping it closed they inadvertently left their fingerprints embedded in the adhesive. Russell’s Policeman had opened the package and unwittingly fingerprinted himself in the act°. ¹ Kororareka² was officially renamed and became part of Russell in 1844. Russell or Old Russell as it is sometimes called was the first capital of New Zealand in 1840 before it was moved to Auckland in 1841 and later in 1865 to Wellington. ² Kororareka translates into ‘how sweet is the Penguin’ however the place itself was infamous for its lawlessness and became known as the ‘Hell Hole of the Pacific’. ³ Section 15 of the Postal Act of 1998 states that mail may only be opened if the postal article bears no address, or if it is illegible, or if it bears no return address or if that address is also illegible, neither applied in this case as both were clearly printed. Furthermore if a postal article is opened the postal operator must give notice of the reason for opening to the person to whom the article is delivered. ° Section 23 states that every person “who wilfully and without reasonable excuse” opens any postal article not addressed to that person is “liable on conviction to imprisonment for not more than 6 months or a fine of not more than $5,000” (Postal Services Act 1998).